Tom Adamich is a digital asset Librarian, certified teacher librarian, and a librarian. He is a graduate of the Kent State University (KSU) School of Library and Information Science and KSU College of Education School Library Media Certification. Adamich’s current research focus is multimedia-based digital asset management, semantic technology, analytics and ontology/taxonomy management. Additionally, he has researched extensively in the arena of K-20 cataloging/metadata creation, exploring its connection to school curriculum, critical thinking skill development, and standards-based education. He has participated in numerous cataloging utilization studies and continues to write extensively on the topic. Come hear what it’s like to work virtually, the skills needed for success, and how to land a virtual gig. Learn what hiring professionals look for when recruiting talent and get the inside scoop from SJSU alumnae who started as virtual interns and turned their experiences into full-time jobs. 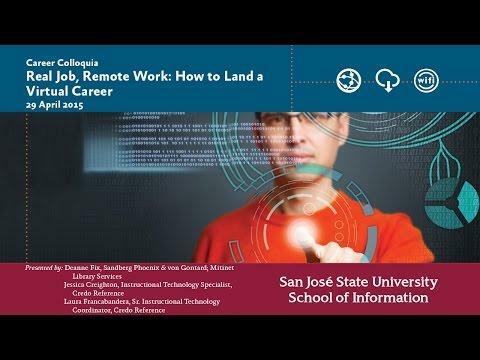 Find out what the virtual job market looks like and how the SJSU iSchool prepares students for virtual opportunities.